Sally is also a published playwright and poet and her day job consists of designing and selling a huge range of t-shirts, bags and other merchandise. Browse through the various books and gifts available here to find your actor friend the perfect gift! Personalized gifts are all the thing. Which is why we’re currently spotlighting Sally’s eclectic Redbubble Store, filled with theatre, film and literature based designs, all from her disordered, yet madly creative brain. Looking for the perfect tee for your best theatre buddy? Look no further. How about a cushion featuring Shakespeare? Got that too. Maybe a phone cover with an Edgar Allen Poe quote? Yep, got you covered (deliberate pun). Maybe an inspirational quote poster for the aspiring thespian in your circle. You betcha. 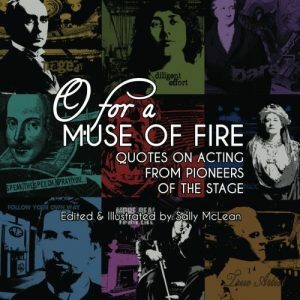 Volume 1 of the ActorSpeak collection of works, O For A Muse Of Fire is a collection of quotes about acting and the creative process from the pioneers of theatre craft, sourced from down through the ages and around the world. With contributions from leading lights of the theatre world in days gone by, from Aristotle to Edwin Booth to Dame Ellen Terry to Mae Busch and more, paired with original pop art renditions of each author’s likeness by editor, Sally McLean, this volume makes the perfect addition to any actor or theatrical aficionado’s literary collection. Ideal for providing that moment of inspiration or edification, this easy to access and fully researched volume brings many rediscovered gems of wisdom and hard-won experience back to light for a whole new generation of artists to digest and enjoy. Sally McLean has been a poet for most of her adult life, penning her first poem – “Lights, Camera, Action” at the age of fifteen, which won her first place in a local newspaper literary competition. She has since been published in several poetry and short fiction anthologies in Australia, Canada, the USA and UK, and was named in the 2004 “Who’s Who of Poetry”, published internationally in late 2004. “Talking With Myself” is a collection of her works from 1990-2010, a period of time that saw her living in London and LA, as well as her home town of Melbourne. It is a deeply personal work, a documentation of one girl’s rite of passage into adulthood, but one that many have identified with from all over the world. Initially presented as an online collection, this book version is now available for all those who have a love of books, a love of poetry and a love of life. NOW AVAILABLE ON AMAZON.COM AND ANY GOOD BOOKSELLER! A celebration of what makes us different, and through that discovery, a recognition of what makes us ultimately the same, “CHASING PEGASUS (A PLAY IN TEN CHORDS)” focuses on the continuing quest of humankind to become more than the sum of our parts. A housewife, two teenagers, a school teacher, an ex-singer, a deaf girl, an accountant, a book shop owner and a shop assistant. What do these people have in common? They are all members of the Serendipity Book Club and they are all about to embark on an unexpected journey. Chasing Pegasus is a play about hope. A celebration of our desire to follow our dreams. A journey towards self-discovery and self-realisation. Ultimately, it is a story about finding the extraordinary in the everyday. A collection of three guided relaxation visualization exercises for actors, designed to calm nerves, increase energy, help focus and remove tension. Created for use every day – not just for those in the acting profession but anyone who wants an instant “de-stress” to help them function at their optimum level at all times. Australian actor, Sally McLean, takes you through these exercises, originally created for her own acting students and now made available for everyone to use.